Today is my first post here, and I’m feeling so happy to share with you guys some inspiration with newest Glitz Design products. All newest collections, released on CHA Winter 2011, are fabulous and when I’ve received my box with Glitz Goodies I just can’t stop to see it all over and over, because they really are amazing: fresh colorful papers, vintage style, many kind of beautiful stamps and a bunch of embellish to use! My style of scrapbooking is something like eclectic with a bit of artistic ways. I love to work with contrasting colors, layering papers and add a lot of details with inks, stamping pads, stamps, and many cut outs and die cuts or another alternative supplies. This is my creative process to explore a many possibilities ways to use papers and other materials. Just a little amazing detail: a sticker under the roses. It's so delicate, isn't it? Sewn paper strips. I love to sew in details! One of my pleasures is transform new paper to an old just watering and kneading it. I made it in this paper layer from Love Games Collection. Here, in special, I used Distress Stain and water. This paper looks like burnt, so cool! I used a blue cardstock as a background, contrasting with this pink paper. The pattern of paper is a mix with partition, vintage texts, announces and much more. This is already one of my fav papers. The harlequin pattern is also great. Blue, pink and green: the palette of this page was so delightful! Loved it! It was made with distress ink (watery ink technique). 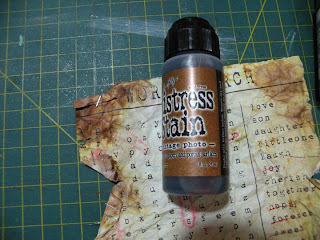 I used distress ink tea dye with this text stamp of Laced by Grace collection and the “arms” stamp by Love Games Stamp Set. And I almost forget to say about this Teeny Alpha Cream Grunge. This vintage circus font is great and so fun! Have you enjoy it with me, thank you so much for stopping by and have a nice day! See you next month!!! SO beautiful!! Rommel, the details you have added are amazing! Love these layouts! I love these layouts!! !I love Rommel okuma!!!! Congretulations!!!! Both are terrific!!! I couldn't wait less than precious LO because that I'm so proud to be the same country as an artist like you!!! Congrats and I'll be waiting anxious for your new adventures in the "Glitz Arts World"! Esses papeis são maravilhosos...aiiii que delicia. Wonderful layouts Rommel, with a lot of techniques! Rommel I loved your layouts, inks and all details. Awesome! Loved all of them!